Details - Water Resistance - Movement Type: Japanese Quartz - Functions: Hours, minutes - MICHAEL KORS Original Box CASE - Silver -plated Stainless steel Bracelet - Silver -plated Stainless steel - Pin buckle closure Bangles - Silver -plated Stainless steel Measurements (cm) Watch - Dial size: 3.7cm 3.7cm - Dial width: 0.8cm - Strap length: Maximum 20cm Weight (grams) - 88grams Colour Details - White - Silver (Strap) Bangles - Strap length: 19cm Weight (grams) - 21grams Colour Details - Silver About Michael Kors Michael Kors Holdings Limited is a global fashion luxury group, consisting of iconic brands that are industry leaders in design, style and craftsmanship. Our brands cover the full spectrum of fashion luxury categories including womens and mens accessories, footwear and apparel as well as wearable technology, watches, jewelry, eyewear and a full line of fragrance products. The goal of our company is to continue to extend the global reach of our brands while ensuring that they maintain their independence and exclusive DNA. Details - Water Resistance - Movement Type: Japanese Quartz - Functions: Hours, minutes - MICHAEL KORS Original Box CASE - RoseGold -plated Stainless steel Bracelet - RoseGold -plated Stainless steel - Pin buckle closure Bangles - RoseGold -plated Stainless steel Measurements (cm) Watch - Dial size: 3.7cm 3.7cm - Dial width: 0.8cm - Strap length: Maximum 20cm Weight (grams) - 88grams Colour Details - White - RoseGold (Strap) Bangles - Strap length: 19cm Weight (grams) - 21grams Colour Details - RoseGold About Michael Kors Michael Kors Holdings Limited is a global fashion luxury group, consisting of iconic brands that are industry leaders in design, style and craftsmanship. Our brands cover the full spectrum of fashion luxury categories including womens and mens accessories, footwear and apparel as well as wearable technology, watches, jewelry, eyewear and a full line of fragrance products. The goal of our company is to continue to extend the global reach of our brands while ensuring that they maintain their independence and exclusive DNA. Details - Water Resistance - Movement Type: Japanese Quartz - Functions: Hours, minutes - MICHAEL KORS Original Box CASE - Silver -plated Stainless steel Bracelet - Silver -plated Stainless steel - Pin buckle closure Bangles - Silver -plated Stainless steel Measurements (cm) Watch - Dial size: 3.7cm 3.7cm - Dial width: 0.8cm - Strap length: Maximum 20cm Weight (grams) - 88grams Colour Details - Silver - Silver (Strap) Bangles - Strap length: 19cm Weight (grams) - 21grams Colour Details - Silver About Michael Kors Michael Kors Holdings Limited is a global fashion luxury group, consisting of iconic brands that are industry leaders in design, style and craftsmanship. Our brands cover the full spectrum of fashion luxury categories including womens and mens accessories, footwear and apparel as well as wearable technology, watches, jewelry, eyewear and a full line of fragrance products. The goal of our company is to continue to extend the global reach of our brands while ensuring that they maintain their independence and exclusive DNA. Details - Water Resistance - Movement Type: Japanese Quartz - Functions: Hours, minutes - MICHAEL KORS Original Box CASE - Gold -plated Stainless steel Bracelet - Gold -plated Stainless steel - Pin buckle closure Bangles - Gold -plated Stainless steel Measurements (cm) Watch - Dial size: 4cm 4cm - Dial width: 0.7cm - Strap length: Maximum 21.5cm Weight (grams) - 112grams Colour Details - Black - Gold (Strap) Bangles - Strap length: 19cm Weight (grams) - 21grams Colour Details - Gold About Michael Kors Michael Kors Holdings Limited is a global fashion luxury group, consisting of iconic brands that are industry leaders in design, style and craftsmanship. Our brands cover the full spectrum of fashion luxury categories including womens and mens accessories, footwear and apparel as well as wearable technology, watches, jewelry, eyewear and a full line of fragrance products. The goal of our company is to continue to extend the global reach of our brands while ensuring that they maintain their independence and exclusive DNA. Details - Water Resistance - Movement Type: Japanese Quartz - Functions: Hours, minutes - MICHAEL KORS Original Box CASE - RoseGold -plated Stainless steel Bracelet - RoseGold -plated Stainless steel - Pin buckle closure Bangles - RoseGold -plated Stainless steel Measurements (cm) Watch - Dial size: 4cm 4cm - Dial width: 0.7cm - Strap length: Maximum 21.5cm Weight (grams) - 112grams Colour Details - Pearl - RoseGold (Strap) Bangles - Strap length: 19cm Weight (grams) - 21grams Colour Details - RoseGold About Michael Kors Michael Kors Holdings Limited is a global fashion luxury group, consisting of iconic brands that are industry leaders in design, style and craftsmanship. Our brands cover the full spectrum of fashion luxury categories including womens and mens accessories, footwear and apparel as well as wearable technology, watches, jewelry, eyewear and a full line of fragrance products. The goal of our company is to continue to extend the global reach of our brands while ensuring that they maintain their independence and exclusive DNA. Case Size - 38 mm. The Mens Bulova Automatic Collection two-tone stainless steel watch features a rose gold-tone case, a black skeleton dial, and exhibition case back. A self winding movement, flat mineral glass, a masculine rose gold-tone bracelet with a simple double press deployment closure, and is water resistance to 100 meters. Dimensions: 43mm. Style 98A166. Limited Manufacturer's Warranty. Keep it simple with the classic lines and rich leather strap of these Womens Citizen(R) strap watches. This classic watch features a stainless steel case, brown leather strap, and metallic silver dial with gold-tone accents, and date. Style FE1082-05A. Limited Manufacturer's Warranty. An unexpected 12-sided bezel lends a dash of extra style to this 3-hand Womens Citizen(R) Eco-Drive watch in stainless steel two-tone with 27mm screw-back case. Additional features include day and date indicator set within a white dial, luminous hands, and fold-over clasp with push button. Water resistant to 100 meters. Style EW3144-51A. Limited Manufacturer's Warranty. Features: -This straw is for keeps:Stainless Steel & Eco-Friendly: Say no to single-use plastic straws and say yes to Dip and Sip reusable stainless steel straws -Kid-friendly: These straws are fun to use-Kids love Dip and Sip, and as a result stay hydrated throughout the day -Dishwasher safe: High quality Stainless steel. Toss it in the dishwasher for full disinfection. Free cleaning brush included. -Get healthy: Drink more water and healthy smoothies. EA-Free, Lead-Free & Rust-free Straw: Drink only what’s in your drink! -Taste Only Your Drink : Plastic straws can leach off flavors and chemicals into an otherwise healthy drink. Use stainless steel straws and taste only your drink! Specification: Color:Silver Material:Stainless Steel Size:215mm x 6mm(Big Straw 12mm) [Conversion: 1mm=0.03937 inch, 1inch=25.4 mm] Package Included: 3pcs Metal Drinking Straws 1 x Brush 1 x Storage Bag Note: -Due to different producing batches, product details might be a little different. If you minding the difference, please buy it carefully. -Please allow 1-3CM differs due to manual measurement. -Due to the different display and different light, the picture may not reflect the actual color of the item. Thanks for your understanding. 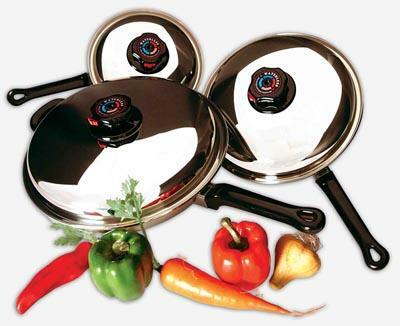 Precise Heat 6pc Stainless Steel Skillet Set with Steam Control Knob. Each piece is constructed of extra heavy surgical stainless steel and guaranteed to last a lifetime. The 9 element construction spreads the heat quickly and evenly. The steam control valve makes waterless cooking easy. 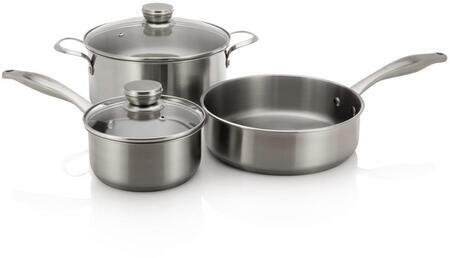 You can cook healthier in these skillets because it eliminates the need for grease or oil in cooking. The handles are superbly styled and are resistant to heat cold and detergents. Includes covered 8 skillet covered 101/2 skillet and covered 12 skillet with helper handle. Limited lifetime warranty. Gift boxed.19 lbs.